I love dogs. Years back when I lived in a house in Florida, I had two wonderful golden retrievers who were my constant companions. One of the most endearing qualities a golden retriever has is this: if you walk into the room where your retriever is, the dog is delighted to see you, overjoyed even. You sit down and read but after ten minutes, you put your book down, go to the kitchen, get a soda, and come back. As soon as you enter the room, your golden retriever is just as delighted and overjoyed to see you as he was ten minutes before. January of 1945 was very cold – one of the coldest winters on record in Western Europe. 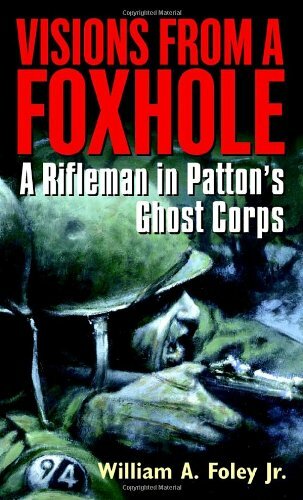 In his outstanding memoir of his service in the US Army at that time, Visions From a Foxhole: A Rifleman in Patton’s Ghost Corps, Private William Foley describes the special hardship this caused US front line infantry who were dug in very close to the German lines. Because of that, the men could not light fires. Even in winter uniforms, the GI’s shivered because they were always damp from a steady drizzle of rain and snow. Getting completely dry was impossible until one’s unit rotated off the front line into the rear area. Private William Foley had just returned from a night patrol. He bailed out the inch of water which had accumulated in his foxhole from the sleet that was coming down. After covering himself with a shelter half (half of a pup tent) and a large rain cape, he tried to get what sleep he could in the freezing cold night.